Deere hopes to help customers reduce waste during the nutrient application process and improve overall efficiency on the farm with its latest acquisition of Blue River Technology. John Deere has officially acquired Blue River Technology, the machine learning technology company that puts a large focus on agriculture. Blue River develops equipment that can be used by agricultural specialists and producers to optimize their daily work. In turn, farmers can potentially reduce inputs and improve their overall bottom line. 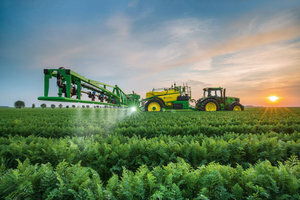 "We welcome the opportunity to work with a Blue River Technology team that is highly skilled and intensely dedicated to rapidly advancing the implementation of machine learning in agriculture," said John May, president of Agricultural Solutions and Chief Information Officer at Deere. "As a leader in precision agriculture, John Deere recognizes the importance of technology to our customers. Machine learning is an important capability for Deere's future." The technology that has been developed by Blue River makes it easier for producers to spray herbicides specifically where weeds are present. This reduces the amount of herbicide that is unnecessarily sprayed on other plants. Eventually, machine learning technologies may be able to be applied to equipment from John Deere. Blue River Technology’s 60-person team will remain in Sunnyvale, California, following the acquisition by John Deere.